4. Quiz: Jupiter has no solid surface: Is it true? 11. Quiz: Vostok is Russian for ------ and Soyuz for -----. 14. Quiz: What were in the balloon sent aloft in 1783 by the Montgolfiers? 16. Quiz: In Physics what is GUT? 17. Quiz: What is a parsec? 18. Quiz: How many eyes do most spiders have? 19. Quiz: What does the insect species Bombyxmori produce? 20. Quiz: What is tidal air? 21. Quiz: What is 'Guano'? 22. Quiz: What is the length of a sun spot cycle? 23. Quiz: Which body has the following arms the Perseus Arm, the Orion Arm, Sagittarius Arm and one called The Expanding Cloud? 24. 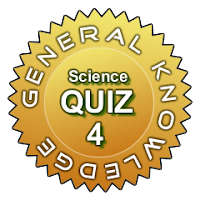 Quiz: In quantum mechanics they speak of the Bose-Einstein statistics. Who is this Bose? 26. Quiz: Name the three most common constituent elements of cells. 27. Quiz: Which disease was also known as Variola? 28. Quiz: What is the process of separating a metal from its ore by heating called? 29. Quiz: In the aircraft industry what is STOL? 30. Quiz: What in Biology is stratification?